Students who participate in the Washington Semester Program take the city on my storm in a multitude of ways. For WSP alumna Maya Peebles, the opportunities, networks, and skills she picked up throughout the summer are what she credits as the perfect boost for her future career in law. "Before I came here, I was set on staying in the West Coast for my life after graduation. But since coming here, I have totally fallen in love with the East coast," says Peebles, who is a rising senior studying Law and Public Policy at University of Arizona. "[This program] definitely expanded my options for what I want to do once I graduate. And I definitely feel strongly about coming back here." Peebles notes that her favorite site visit that she and her classmates took was to the World Bank to speak with WSP alumnus Dr. Achim Schmillen, now a Social Protection & Labor economist. With his colleagues, Dr. Izabela Leao from the department of Rural Development & Labor and Dr. Federica Secci who specializes in Health, Schmillen talked about the inspiring work they do across the globe, as well as the unique opportunities available for young professionals aspiring to work in international development. "It was so inspiring and so amazing!" she added. 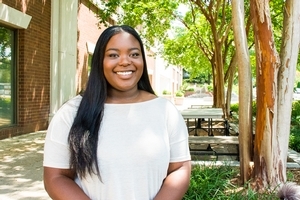 Above all, the most empowering part of Peebles' summer in DC has been the impact she has had on veterans seeking support to succeed in higher education. Most notably, she and her team at Student Veterans for America pushed a piece of legislation that provides greater institutional protections for veterans across all branches of the military. Known as the Harry W. Colmery Veterans Educational Assistance Act of 2017, or the "Forever GI Bill," her organization provided 35 protective provisions to update the original GI Bill. "[My boss] testified in front of both the House and Senate Veterans Affairs Committees as well as others and met with dozens of offices," explains Peebles. According to Peebles, the team's legislation gained unanimous support from national veteran support organizations, as well as the White House, the US Department of Veteran's Affairs, the Department of Labor, and diverse consumer groups -- thus passing in the House. This bill now awaits a vote in the Senate, and Peebles' team is hopeful and enthusiastic about its progress. "I've always wanted to give back to people who have done so much for the country," explains Peebles. "My boss [Mark McKenna]...was a student veteran himself. Just listening to the passion in his voice really made me want to get on board and help people as well." In supporting The Forever GI Bill, Peebles sat in on the both the Senate Veteran Affairs Committee hearing as well as the House Veteran Affairs Committee and watched one of her mentors outline the 35 sections/provisions to improve the GI Bill. "I've always wanted to work with nonprofit, and I think the work that we do at Student Veterans of America is very rewarding. You never actually see the veterans that you work with, but you can just tell that they are so grateful for the work that I do for them."